Mark Greening (former Electric Wizard, also of Ramesses, With The Dead) and vocalist Virginia Monti (Psychedelic Witchcraft) joined forces to found the heaviest occult psych superbeast to see the light this year. Keeping it mysterious, the band released a couple of snippetsfor their upcoming works. Metal Nexus comments describes these audio previews as "an alluring, somewhat hypnotic style of music steeped in vintage aesthetics and mystique and I have no doubt this is going to be killer oncecompletely unveiled". The Debut album from the Obscure Dead Witches "Ouija" is full of Doomy Slow grooves.There‘s something Occult in the Riffing, while classic doom drumming by the great Mark Greening meets the warm vocal melodies of Virginia Monti. 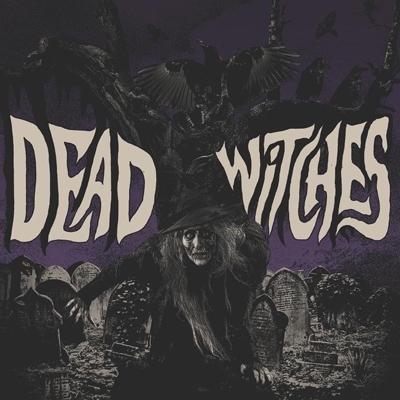 Recorded in October 2016 at the Chuckalumba studio, where Wizard‘s Dopethrone was done, the album is produced by Dead Witches and John Stephens. Artwork by Goatess Doomwych. For Fans of: Electric Wizard, Sleep, Pentagram. Beware as the witches are coming to take your soul.